Born and raised in Steel City, Jamshedpur, I developed a fascination for painting at the age of 12. 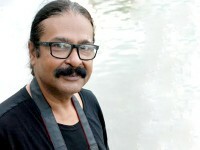 I went on to pursue Arts and graduated from Govt College of Arts & Crafts (GCAC), Kolkata, India in 1990. I was chosen under the Young Artists Category for a West Bengal Government project by Tathya Kendra, Kolkata in 1986. My debut show was in 1994 at Chitra Kala Parishad, Bangalore where I participated in a group show of young artists. In 1996, I was a part of another group show at The Art Konsult, New Delhi. Over the years, water colour has become my favourite art medium and now I explore it further and develop my own style, a unique style characterized by strong brush strokes that impart a sense of freedom of spirit. I am also experimenting with water colours on canvas which has been very unique and deeply appreciated by many. Since my childhood, I have been attracted towards water colour which is considered to be one of the most challenging mediums to indulge in. Water colour remains my forte and my love and respect for nature has never wavered. I try to convey the beauty, majesty, and intelligence of nature's creations through my brush strokes that are a mix of British School art and textured water colour. My solo debut 'Relate' at Triveni Kala Sangam, New Delhi in 2011 was a joyous ensemble of trees, natural landscapes and experimental work exuding a vivid energy. “Universal Truths”, a group exhibition at Gallery Defence, New Delhi was explicitly bold and conveyed the rhythms in human anatomy along with the inherent rhythm of Mother Nature. I have been a part of the International Mask festival 2011 wherein over 300 contemporary artists spread across India had designed masks showcasing different cultures, ideologies and traditions as a way to celebrate human existence. I was one of the shortlisted winners at the '100 years of the City of Delhi' held in 2012 at All India Fine Arts & Crafts Society (AIFACS), New Delhi. Since 2011, I have participated in more than 20 group shows and had 5 solo shows. Some of my works are a privileged part in the Private Collection of hotels across India. I am based in New Delhi, India. Artworks shall be shipped through reputed courier services. Please do not accept the shipment if it appears damaged/tampered with on arrival. Each artwork being original and one of a kind, providing replacements/refund shall not be possible. However, if you have any concerns for me to review please reach out to me within 36 hours of receiving the artwork and I shall be happy to help.